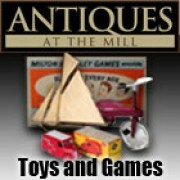 Antiques at the Mill generally have a wide range of toys and games available through our selection of dealers. We have one toy dealer that specializes in anything Hornby, particularly, Dublo including locomotives, carriages, trackside items such as signal boxes etc. Another dealer specializes in Dinky, Corgi and Triang model cars dealer. These include commercial vehicles, agricultural and other collectables. Antiques at the mill often have other vintage and antique items of interest, Notably we’ve recent had bagatelle games, sailing boats, a children’s tricycle, a vintage pedal car, antique and vintage chess sets amongst other board games to name a few. A set of 10 die-cast miniature toy soldiers, the 'Soldiers of the Empire', Territorial Army Ceremoni..
A lovely example of a novelty money box or 'piggy bank' from the 1930's. Retaining original vibrant ..
Bakelite Ink Bottle Holder Great condition-no chips or cracks Marked- PROV. PAT. No 3670/30..
Britains 18" Howitzer mounted for field service. No 2107 Complete with 6 shells and loader. Ful..
Corgi Toys "Whizzwheels" Yardley McLaren-Ford M19A scale model formula one car. 1:36 scale, original.. Complete set of dominoes made in the USSR, plastic. Produced sometime between 1922 - 1991. Some..
Draughts pieces - 'Harlesden Series', complete set. Set of wooden draughts pieces in original cardboard box, by 'Harlesden Series' of England, circa 193..
Hornby Dublo 3-rail Loco. L30 British Rail Bo-Bo Diesel-Electric loco No. D8000. ..
Hornby Dublo Locomotive British Rail 4-6-2 "Mallard", with tender. Produced in1958 only, w..
Hornby Dublo 3-rail British Rail Suburban Coach 1st class/3rd class. Part D13/32090. Produced betwee..
Hornby Dublo 3-rail British Rail 1st class/2nd class Suburban Coach. Part number D22/3202. Prod..
Hornby Dublo Bogie Bolster Wagon - British Rail. Condition very good, all transfers intact. Produced..
Hornby Dublo British Rail 40-ton Bogie Well Wagon. Part number D1/32053 with Blue and Whit..
Hornby Dublo High Sided Coal Wagon - British Rail. The condition is good with some loss of pai..
Hornby Dublo 3-rail British Rail goods van. Part number D1/32040. In excellent condition. ..
Hornby Dublo British Rail Locomotive "Bristol Castle"
Hornby Dublo British Rail Locomotive "Bristol Castle", with tender and "The Bristolian" headboard. U..
Hornby Dublo British Rail grey mineral wagon. Part number D2/32056. Produced between 1953 - 1958. In..
Hornby Dublo 0-6-2 Tank Locomotive British Rail No 69567. EDL17. An uncommon, early 3-rail ..
Hornby Dublo High Sided Coal Wagon - North Eastern, with coal. A rare model. The condition is good w..